I managed to adjust the coat I'd almost finished yesterday without having to sew a whole third version. Thanks be. I figured how to alter the collar, then removed the top snap and added it under the other two snaps, and pressed the lapel into place. It looks great now. My buttons arrived too, so I've added those to finish it off. Here's the second version I showed yesterday, with the alterations next to it. I think it looks a lot better. It'll look great with a scarf too. I added two buttons to the belt at the back. these are 6mm buttons and okay for coats, but I need to get some smaller ones for things like waistcoats. Hand painting my own home-made buttons is taking up a bit of time, so I might buy a few more for reserves. This first one has a cape that sits under the collar and lapels, nice and easy to figure out. Incorporating a cape into the coat itself as I sew will create so much bulk, that I'd rather make the cape as a separate accessory. Then once the pattern is published, it will have more versatility. However... on a doll scale, unless the fabric is incredibly soft and drapey, the weight of the fabric is not enough for the fabric to fall properly. I made a prototype to experiment, but it just stuck out stupidly and wouldn't hang. It's okay, but could do with reshaping a bit around the bottom hem. At the moment it's not attached. It sits perfectly over the coat shoulders and doesn't actually need any attachments if the doll is on display, but I will work out some kind of arrangement to attach it and make it removable. It's a teeny bit bell-shaped for my liking just now. The bottom hem kicks out too much, and the point could be pointier, but it's getting there. Wow - it looks really good and I love seeing your design process from finding inspiration pictures to the finished article - you're very talented! I love to see other peoples design process photos, so I'm glad someone enjoys mine! Thanks Trish. I'm hoping the long version of this coat will be amazing. Progress on the Jedi outfit. Jedi trews for 17" Tonner guys. Starting the Jedi outfit for 17" Tonner guys. 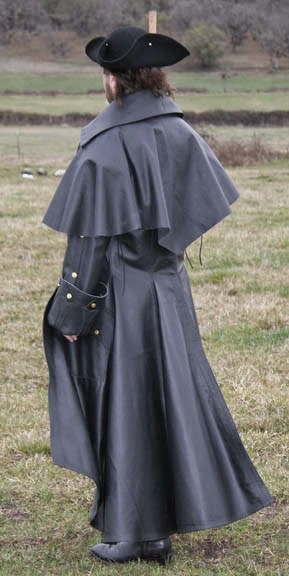 Finished Highwayman coat for 17" Tonner guys. 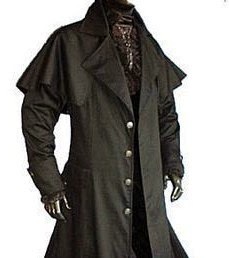 Long black coat for 17" Tonner guys. Draft 2 of the Tonner 17" male coat. Starting work on a new design.